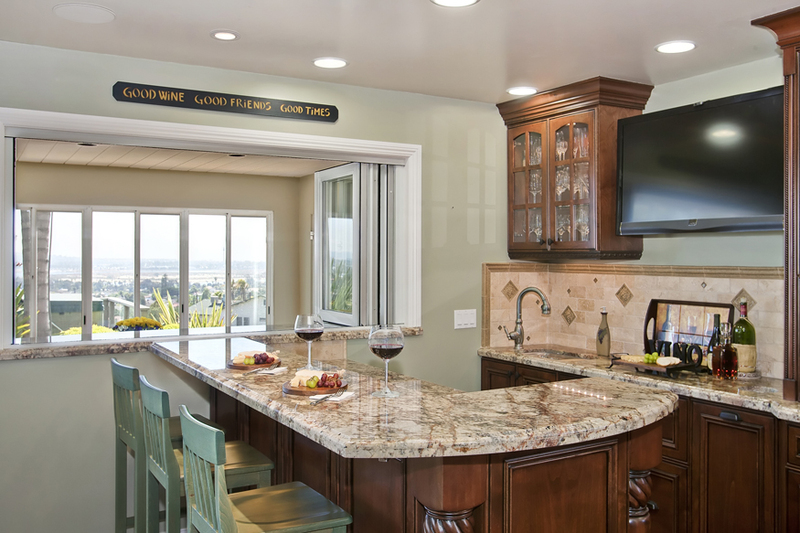 San Diego Kitchen Remodeling - Lawson Construction Inc.
On this kitchen remodel, (featured in the video), there were two other proposals under consideration. The client chose Lawson Construction because they could go through each line item and know exactly what they were getting and for what price. The original kitchen was a 1960s kitchen and was only about about 11 x 16. Two walls were taken out along with the wall between the kitchen and family room, which became the dining room; where the fireplace is. Twenty Six feet of wall was taken out from the second story and a beam put in with 3’x3’x3′ pier footings to hold the posts, making the entire area feel much larger. Mike & Rick opened up one of the walls to the sunroom to put in a bi-fold door. allowing for a 12 foot opening. By the wet bar a similar window was installed with a counter on the outside. This adds light and provides insulation in the winter while opening up for summer breezes.